Ryan, a writer in his 30s often juggles between reality and fiction. He is unable to find the perfect plot for his crime thriller stumbles upon a pair of Augmented Reality glasses that changes his life forever. He could see what other can't see, he is constantly meeting people from other parts of the country and exploring newer places virtually. His brain is manipulated by computer generated images. In the whole process, he is losing his capability to judge between real and illusionary pictures now. Although, he is one of the most well-informed guys in town, he is often found hallucinating and talking to himself. People think he is crazy but he is not, this is the impact of Augmented Reality and the nightmare waits for most of you if technology overpowers humanity in the near future. This will be the case of everyone as predicted by Stephen Hawking that computers will make human brains obsolete. So let's find out the pros and cons of embracing future technology like Augmented Reality. It's a very raw stage to predict but what if doomsday for humanity comes before time. Augmented Reality promises to transform your future into the magical world. The intervention of virtual world superimposed in your physical world is what Scientists are trying to do for our future. Augmented Reality or enhanced reality is something which will make the world super transparent and easy to navigate. Augmented Reality will eventually take over every aspect of mankind and the thought is both whimsical and scary at the same time. Currently, you need a smartphone or glasses to see a completely computer generated world. Augmented Reality apps are currently at beta stage but it will surely take over humanity within 5-10 years completely. That day is not far when you will be able to read a newspaper and also access videos embedded in the printed newspaper through augmented reality glasses. You will be able to store everything in your printed visiting card and access them anywhere, anytime. Imagine, you are walking in the streets of Manhattan and you need to find an Indian Restaurant nearby, just wear your Augmented Reality glasses and look around, you will be able to see all kinds of restaurants with menus and user reviews right in front of your eyes. There will be virtual sales person appearing everywhere that can give you a nightmare. That day is not far when you can access the whole profile of a person standing at the bus stop by looking at the person through Augmented Reality glasses. However, there will be a privacy issue with this which can be easily prevented by the person. Everyone can make their data password protected. You have the control to allow or not to allow your information to be seen by the passerby. Augmented Reality is one of the most delightful Artificial Intelligence inventions however, there can be major nightmares associated with this technology. Technology is slowly making humankind dependent and lazy, it's making your life easier still too much of technology can manipulate human mind and there's a chance of falling into a major trap of machines and robots in future. 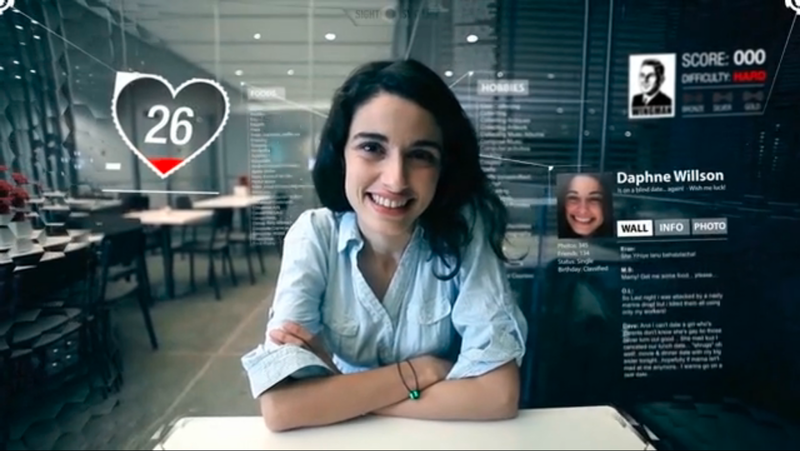 Augmented Reality promises to transform the communication world completely. You will be able to see the person in front of you while talking over a phone. A virtual 3D world will be created in front of you. The impact of this technology will be so high that people will prefer to stay in their virtual world and completely disregard reality. The chances of getting addicted towards this kind of technology are very high. From Archaeology to Architecture, from Art to Commerce, from Construction to Military, from Education to Medical applications, augmented reality apps can be used in almost every field. For eg, there are Augmented Reality T-shirts available which allows you to look into your body. You can easily see the anatomy by wearing Augmented Reality glasses or by placing the camera of your Smartphone with Augmented Reality app over the T-shirt worn by someone. AR is touted to be the next big thing and most of the tech giants are investing heavily on this. Just like the Internet, Augmented Reality and Virtual Reality will change the way Humans live, Think and Survive. Imagine the world when you can be virtually present in all the major events from Olympics to World Cup, just by wearing Augmented Reality glasses. You are virtually present amidst the crowd and cheering for your favorite Team. With the advent of Augmented Reality, you will be thrown into a world of Mixed Reality and you have the power to select the best truth. Right now, few options such as Contact Lenses, Eyeglasses, Head mounted display, Head-up display, eyeTap, Handheld etc. are available to access the Augmented Reality environment. Lots of exciting things are happening around the concept of AR and VR (Virtual Reality) around the world. Magic Leap is one such company which is currently working in stealth mode for making AR the greatest tool to change the world in future. From Steven Spielberg to Harrison Ford, everyone is excited about the brand new computer-mediated world. Things that look magical today become monotony in future, although Augmented Reality promises to give you the best out of this world experience, still the apprehensions will stay as everyone wants to guard the beauty of humanity, which is hardly found in machines.